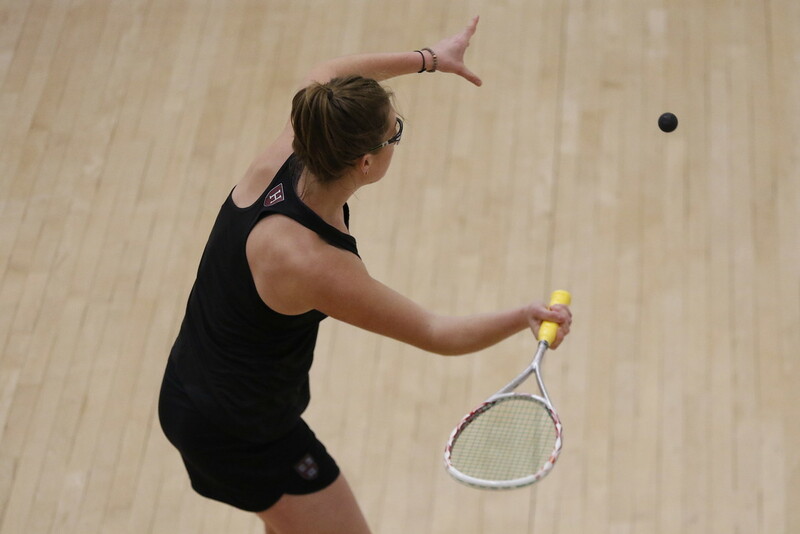 The Harvard women’s squash team finished its historic season over the weekend in the national Championship with yet another shutout 9-0 win. The Crimson swept No. 3 Trinity for its fifth-consecutive Howe Cup. Though the team has obviously retained an impressive level of squash excellence, this season was even more remarkable than the previous four, as every single player on the team went undefeated. This inevitably created high pressure for the players heading into the championship weekend. Sobhy was one of two matches that went to four games. She lost the first game to Trinity’s Luz Sarahi Lopez Dominguez 11-6. However, she refused to be the one player to break the perfect season; Sobhy rebounded and fought back to win the next three games, 11-3, 11-3, and 11-8, respectively. The only other match to go to four games was on the third court, where Harvard junior Amelia Henley was competing against Trinity junior Salma Alam El Din. The match was incredibly intense, as Henley lost the first game 11-5 amidst controversial rulings. Similar to Sobhy, the competitive mindset set in, and Amelia recovered, winning the following three games 13-11, 11-9, and 11-8. Henley’s impressive win was a huge moment of the weekend for her junior teammate Gina Kennedy, even though Kennedy won her own match, 11-4, 12-10, and 11-5. Though the team only needed to win five courts every match to extend its 65-game winning streak, the Crimson refused to let up a single game this entire season, winning all 117 individual matches played. Even if the Howe Cup might have been an expectation for this dominant team, the national championship win was special for each and every Harvard player. Despite the team’s impressive dominance over the past half-decade, it somehow managed to improve this season. Sobhy and Kennedy both attributed this team’s excellence to the team dynamic. “Everyone is always early to practice, not because we’re told to be early, but just because that’s the nature of our team,” said Kennedy, offering an example of the team dynamic. Sobhy elaborated on this positive team chemistry. Though squash is a sport of individual matches and mindsets, this season’s unprecedented success came about through the emphasis on winning for the team.